"Bitty Brynne" has a high quality mohair blonde wig (so soft), beautiful blue eyes and charming dimples. 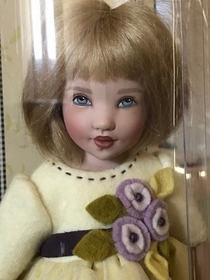 This very special 11" doll was produced from the collaborated efforts of Maggie Iacono and Helen Kish. Helen's sweet Bitty Brynne is wearing a 'Maggie Made' outfit. 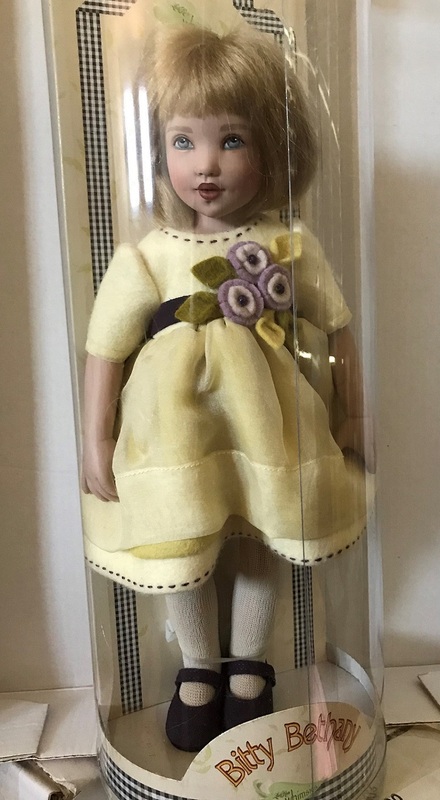 She's wearing a yellow wool felt dress with a yellow chiffon over-skirt embellished with a bouquet of lilac felt flowers attached to a purple waistband. The dress is accented with purple topstitching. Her outfit also includes white knit tights and very purple purple suede Mary Janes. She's still attached inside her Kish plastic tube - hence the glare on her photos.